An acrylic elastomeric roof coating designed to form a rubber-like membrane over a variety of roof surfaces. Reflects the sun’s rays resulting in energy cost savings. Designed for use on metal, polyurethane foam, masonry, asphalt and wood surfaces. Dries white. Polyurethane foam, asphalt, mobile homes and RV’s, concrete, wood and more. 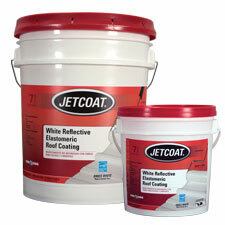 NOTE: This product is not recommended for gravel, dead level (flat), or shingled roof surfaces. Lowers interior home and building temperatures providing energy savings. 66205 4.75 gal. Pail 55 lbs. 66201 .9 gal. Pail 11.3 lbs.